Work is under way on Lincoln's first purpose-built mosque, which Muslim leaders say will help bring local communities together. Construction of the mosque, on Boultham Park Road, officially began earlier. Chairman of the Islamic Association Tanweer Ahmed, said the facility which he described as "long overdue", would promote the true message of Islam. He said non-Muslims were also very welcome to visit. Mr Ahmed said: "It has been 10 years since the project began - we've been through good times, bad times, disappointment, but the day has finally come." He said the mosque would "engage more actively" with men, women and particularly with the younger generation of Muslims. The building will provide facilities to pray, a library, funeral preparation room, and space for community activities. Local Muslims have been worshipping at a small former Baptist church since 1981, and holding Friday prayers at the Grandstand Community Centre. Mr Ahmed said larger premises were needed because the Muslim population of Lincoln had "grown rapidly" and there was a "strong feeling we needed our own place which we could use anytime we wanted." 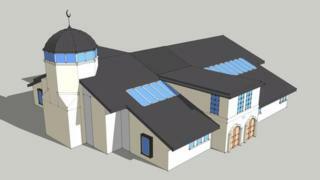 There were plans to build a mosque on the site of the former St Matthew's Church, close to the current site. However, it was destroyed by fire in 2008. The building on Boultham Park Road is due to open next year.